She was part of the national heritage in Norway. When Norwegian Broadcasting (NRK) announced on national radio Wednesday night that singer Nora Brockstedt had died, at the age of 92, you could almost hear listeners’ collective “Oh,” and a sorrowful sigh. Given her advanced age, Brockstedt’s death was no surprise, but she was the kind of public figure in Norway who just always seemed to be around. Since her debut during the war years and her pioneering presence on radio and, in its earliest days, TV, Nora Brockstedt helped define Norwegian entertainment. 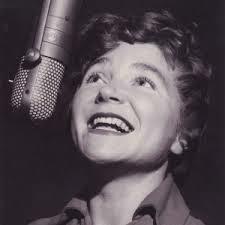 When Norway took part in the European Song Contest for the first time, in 1960, it was Nora Brockstedt who represented the country, and place an impressive fourth with her song Voi Voi. She also won the Norwegian final the next year, with Sommer i Palma, and in 1963 with Solhverv. She took part in the international contest, known in Norway as Melodi Grand Prix, no less than 11 times and played a major role in the hype that still surrounds the contest to this day. She was more than a pop music star whom some NRK officials called “Mother Grand Prix.” She recorded many of the folk songs written by another Norwegian icon, the late Alf Prøysen, and was perhaps most famous for Tango for to and En liten pike i lave sko. She was a key player in the cabaret world, following her debut at Oslo’s Chat Noir in 1943, and she even sang jazz in nynorsk, the less-used official form of the Norwegian language that’s rooted in dialect. Kleveland, also known for having a special voice, noted how Brockstedt impressed fans and colleagues alike by maintaining her voice and having such a long career. She recorded an album after she’d turned 80, that featured classic songs and sold well. She won many awards and clearly enjoyed being inducted into Norway’s musical Hall of Fame at the Rockheim Museum in Trondheim just two years ago. “She was Norway’s queen of popular songs,” said Vidar Lønn-Arnesen, a longtime program host for NRK. Many were referring to Brockstedt’s “style and integrity” on Friday. “She was cool before people talked about ‘cool’ people,” Kleveland said. “She had real style, in an unpretentious manner.” Per Sundnes, who ran NRK’s Eurovision participation for many years, said that Brockstedt was a pillar of modern Norwegian culture. “She’ll be remembered forever,” he said. Brockstedt died at Ullevål University Hospital in Oslo on Wednesday after what her family described as a “short illness.” Funeral arrangements were pending.